Your Chromebook password is your Google password, so you change them the same way. To change your Chromebook password, you need to change your Google account password. This can be accomplished using your Chromebook, or you can use any other computer, tablet, or phone that's logged in to your Google account. If you have two-factor authentication enabled, make sure you have your backup codes written down before you proceed. Your Chromebook password and your Google password are one and the same; you change them the exact same way because you only use a single password for all of your Google-connected services and devices. You can change your Chromebook password on your Chromebook. Since your Chromebook password is literally your Google password, you can change it on any device and any web browser, so long as you're signed into Google. This will change your Google account password, not just your Chromebook password. The next time you attempt to use any other Google service or device, like YouTube or an Android phone, you will have to log in using your new password. Note: If you've set Chrome to open a custom website on launch, you'll need to manually navigate to Google.com. Select your profile picture in the upper right corner. Scroll down to the Signing in to Google section. Enter your current password, then select Next. Enter your new password, confirm your new password, then select CHANGE PASSWORD. You can change your chromebook using your phone and various other devices. When you use your Chromebook to change your password, the Chromebook automatically syncs to your Google account. The new password becomes active immediately, so if you shut down the Chromebook and boot it back up, the new password will work. If your Chromebook is off, and you change your Google account password with another device, you may need to enter your old password to log into your Chromebook. Once you've logged in, the Chromebook will sync with your Google account, and the new password will become active. In the event you changed your password because you forgot your old password, you'll be unable to log in. 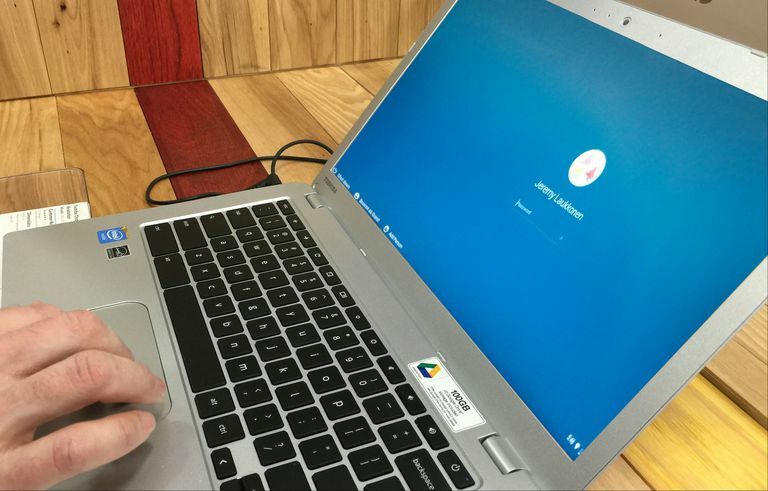 If you're unable to remember or find your old password, the only way to continue using your Chromebook may be to powerwash it and return it to its original factory settings. To prevent data loss from this type of event in the future, it's good to avoid storing important data on your Chromebook, and instead, upload it to Google Drive. Two-factor authentication is a security feature that can prevent anyone from logging into your Chromebook or Google account without your permission. Changing your password regularly is a great way to stay safe, but enabling two-factor authentication locks your account down tight. Make sure you've written down your backup codes before you change your password. Google's two-factor authentication is called 2-step verification. When you turn it on, you provide your phone number, then Google sends you a text message with a code each time you log into your Google account on a new device. If someone tries to log in without the code, they won't be able to. In addition to the text message type of 2-step verification, Google also allows you to set up a prompt on your phone to verify new sign in attempts, and you can also use the Google authentication app if you prefer. If you two enable two-factor authentication, it's very important to write down your backup codes. These are codes you can use to bypass the text message system, in case you lose access to your phone, so keeping them in a secure location is vital. Each code can only be used a single time. Backup codes are especially important if you use Project Fi as your cell provider. Since Project Fi phones don't work until you have logged in with your Google account, you'll be unable to log in and set up a replacement phone if your old phone is lost or broken and you don't have backup codes to get around the 2-factor verification process.